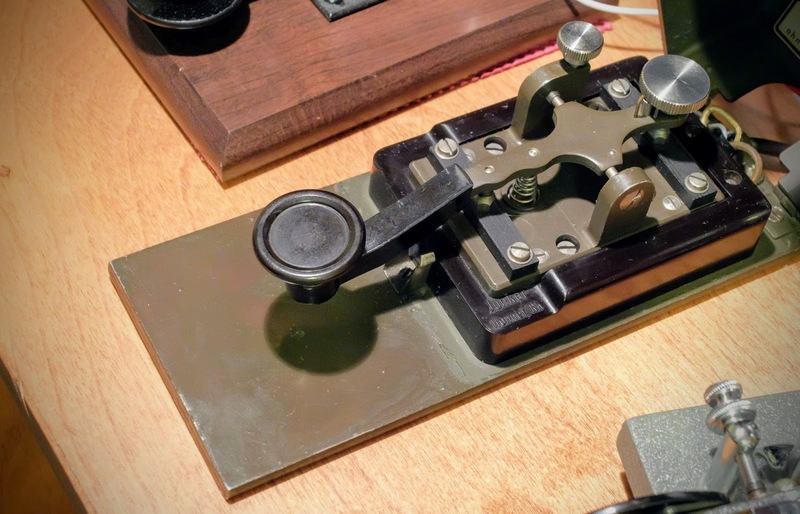 The Junker is one of the finest telegraph keys ever manufactured. In 1926, engineer and marine captain Joseph Junker, founded a factory in Berlin which made equipment for radios and submarines. He was the creator of the Junker telegraph key. At the end of World War II, the factory was moved to Honnef just before Joseph died in 1946. The phrase "German precision" is applicable here. Historically, German engineers seem to go above and beyond what is minimally required for a design and often "over-engineer" their products. This key is a perfect example. 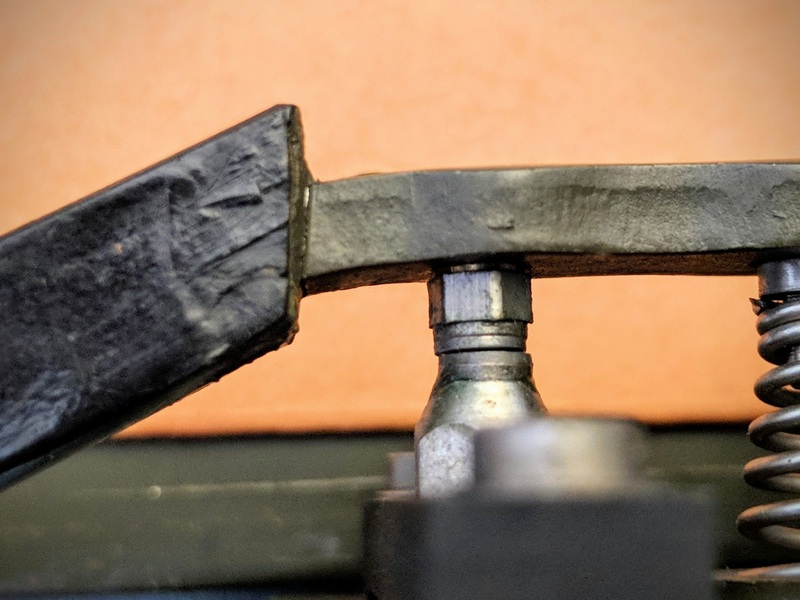 The Junker excels in the precision of its construction, and may have the most controllable gap adjustment of any straight key in the world, resulting in the ability to send very clean CW. The knob at the rear of the key moves in precise clicks controlled by a ball bearing plunger under the knob, engaging small detents underneath the wheel. Each click moves the gap one-tenth of a millimeter. That is "very" precise. Unlike most straight keys when the gap is set at it's minimum it's calibrated to actually be a minimum gap and not allow the contacts to touch. I don't have a feeler gauge thin enough to measure the gap but it's there. It's so small, that I can't discern the lever actually moving when I operate the key, but it makes clean contact with zero mushiness and nearly effortless operation of the key. The lever force, or tension adjustment is singular as well. The smaller knob on the left trunnion base moves a cantilever under the base of the key that moves a plate under the lever spring. 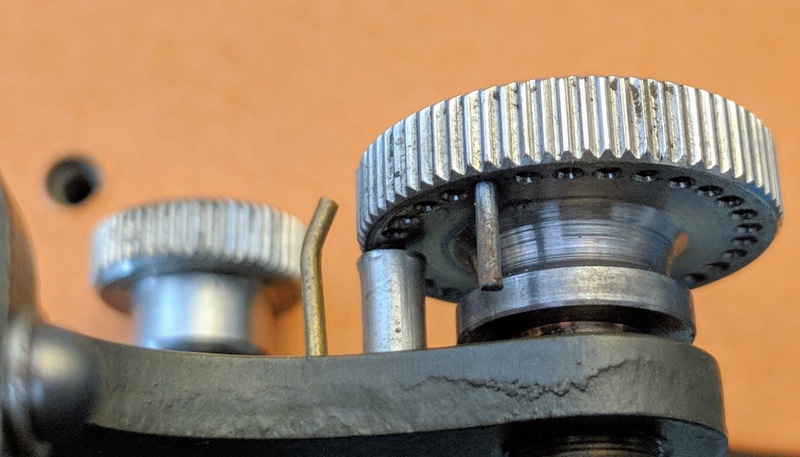 So rather than compressing the spring from the top of the lever at it's narrowest, it is compressed smoothly from the base up into the lever. Just amazing! Some Junkers came with an RF suppression coil comprised of a many turns of hand-wound, insulated wire tied into a tight loop and held with ties fitted up into a circular recess in the base of the key. 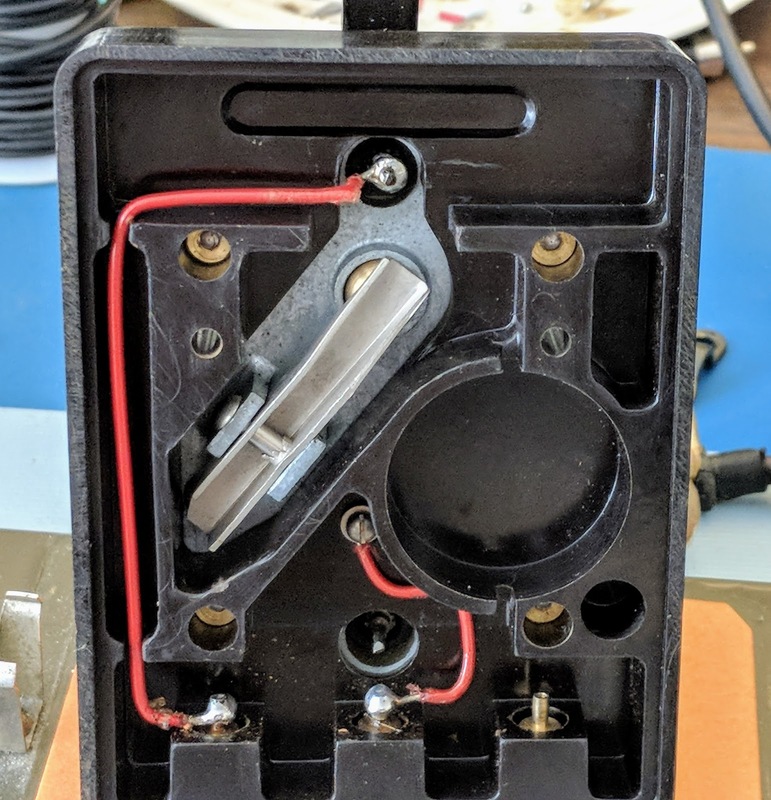 My key did not have the RF suppression coil, which is fine, since I am not operating a high-voltage keying circuit that might benefit from the coil. I've read that some users have encountered problems due to the fine wire of the RF coil providing too much resistance and have bypassed it. No need here. under the base of the key, notice the armature for adjusting the lever tension. Most straight keys I've used in the past two years employ a Navy-knob style grip that I've grown accustomed to. The Junker has a lower (about 2.5" above table), flat lever disc. It's odd how used to the Navy style grip I've become. I practiced for about 15 minutes trying various grips. 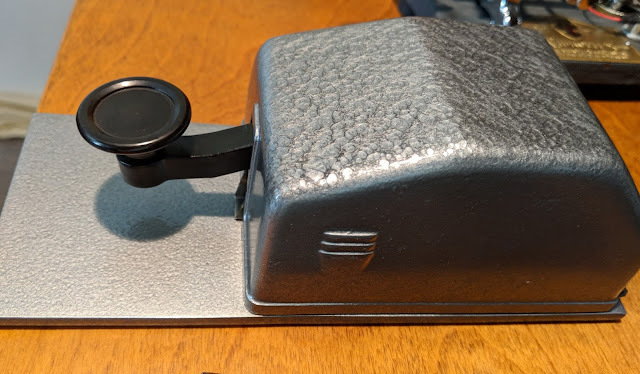 I still operate with my arm in free-space and I imagine with this key I'm supposed to rest my elbow on the desk but I don't have room for that at my station so I operate with the key at the edge of the desk. Anyway, I settled for now on sort of a loose fist style grip where I'm resting the first knuckle of my middle finger on the dish of the key while lightly gripping the disc. Seems to work and the more I operate the more comfortable I'm becoming with it. The level of adjustment is truly amazing. 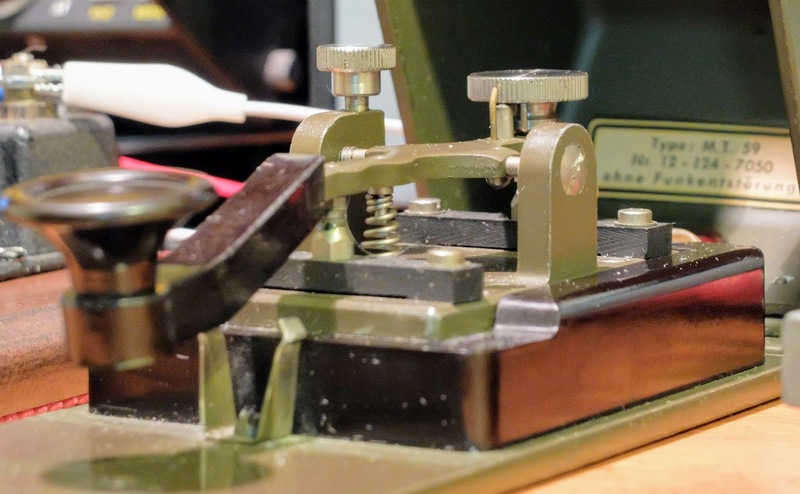 Being able to quickly change gap adjustment during a QSO to relieve fatigue or just try a different spacing, without messing around with a set nut, or worrying about actually closing the contact was novel, and fun. Not being terribly enamored with the rough appearance of the old key I removed the aluminum corrosion from the cover and the heavy handed brushed paint from the base with a bit of light sanding, and sprayed it with hammered silver. I also made a proper cable and plug for it. Now it's fresh as a German daisy. The demonstration QSO below was my first contact using the Junker after a few minutes of practice. I'm sending at about 17-18wpm. After a couple more QSOs and bit more practice I was easily sending at 20wpm which is faster than I'm comfortably able to operate my other straight keys. Following the introduction to the Junker is a full length QSO using the Junker on it's first Amateur radio QSO with W4PCA. I'm looking forward to using this Junker and comparing it head-to-head with my Navy Flameproof. Initial impressions between the Flameproof and the Junker give the nod to the Junker. The Flameproof was previously the most controllable and precise straight key I owned but the Junker makes it feel mushy in comparison. I do prefer the grip of the Navy, so time will tell whether I become as comfortable using the Junker as I am the Navy Flameproof. Tento klíč mám od svých 12 ti let .Našel sem ho na vrakovišti letadel .